After giving the matter a lot of hard thought, I finally decided that without access to the Trinity pasture I don’t really belong in the cow business. I mean, I could probably make it work one way or another if I put a ton of effort into it, but…it just isn’t important enough to me to put a ton of effort into. Plus I would be dependent upon the resources and goodwill of others for the foreseeable future, and frankly that makes me a little twitchy. So Saturday a bunch of us got together and rounded them up. For some reason three of the cows were BEYOND RESISTANT, and we spent a ridiculous amount of time getting them into the corral with the rest. They turned actively mean as the morning progressed, charging at riders and generally creating as much trouble as they could for us. We ended up having to rope those three and drag them in, while they did their best to take down every horse within reach. I have no idea what caused the change in attitude; they were never aggressive before. Possibly there has been more harassment going on here than I’ve been aware of. …while others fought us for every inch of ground. 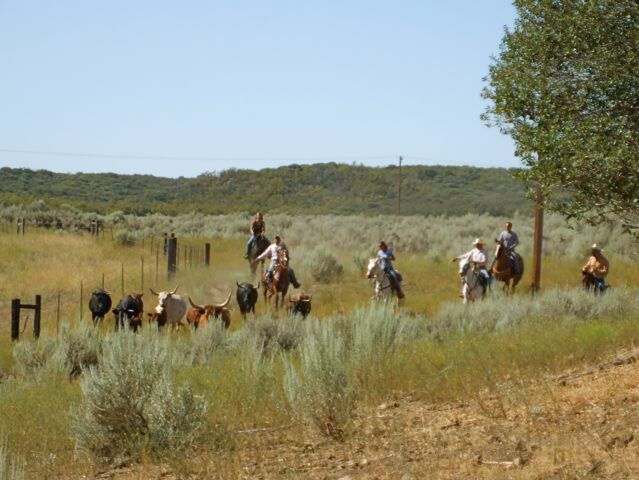 Once the the herd was finally loaded up, we put the horses in the other trailer and took them to Doc’s place, then hauled the cows out to Garner Ranch. Garner Ranch is a big historical cattle spread up in Garner Valley, the kind of operation people don’t even build anymore. It has the sort of facilities us small-time ranchers can only dream of. The Mighty Herd was going there to be ear-tagged, vaccinated, wormed, tested for brucelosis, for that youngest calf to be castrated and for two of the cows to be preg-checked. The quickest way to accomplish all this was to run them assembly-line style through the squeeze chute at Garner Ranch. When we got there we had to wait our turn for the alley: a rodeo bull supplier guy was using it to train a few troublesome bulls to enter chutes. They all had cool rodeo bull names like City Lights and Mr. Moody. He ran them through the chute over and over for a while before finally shunting them into a side corral. We unloaded The Mighty Herd into a different corral and then took a lunch break. Doc’s wife Anita had brought a wonderful spread of goodies for us, and we all kicked back in a shady spot and gave it the attention it deserved. After lunch we started running the Herd through the alley. I had to leave in the middle of all this because I was John’s ride home and he had to be back by 3:00. But the Herd all made it safely back to Doc’s place that afternoon, and that’s where they’ll be for the next week or two. Doc brought Mahogany home Sunday afternoon. All of the local folks who want to buy calves can come and pick out the ones they want while they’re in Doc’s arena, and then the rest will be sold together and moved to a pasture on the Res. Right now beef is going for about 88¢ a pound on the hoof, which should add up to a nice chunk of cash for the twelve of them. I feel like all of the strands tying me to my old life are being snipped one by one, and I’m being freed up for whatever’s waiting in my new life. There are still a few strands left to snip, but I’m content to be patient and leave those in God’s hands. Farewell, Mighty Herd! May all your pastures be green, all your water be sweet, and all your bulls be Prince Charmings. I’ll miss you guys.